This post is a part of the Follow Your Heart series. Just a few short years ago, I made my living playing poker. I had no idea what the term “follow your heart” even meant. However, I gradually uncovered that I didn’t have to struggle my way through life. Instead, I could listen to my inner GPS, my heart. Making this shift changed my life. But what does it mean to follow your heart? What does it look like in the real world? That’s exactly what you’ll discover in this article. But I realized that living a “logical life” was only pulling me deeper into misery. Eventually, I had nothing to lose, so I began experimenting with following my heart. When I talk about following your heart, I’m not referring to your physical heart, although I’m sure it plays a part. I’m pointing to the area in the middle of your chest, because that is often where I feel the energy that I call my heart, and that most people refer to when they tell you to listen to your heart. It’s also known as the fourth chakra, the heart chakra. It is often associated with love, wisdom, and compassion. There’s nothing magical about it. 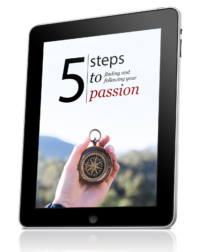 We could spend time theorizing about what it does and how it works, but what I care about is that it helps me live a passionate, purposeful, and fulfilling life. When I follow my heart, I listen to the feelings I have about decisions in my life. An example I use in my book, Follow Your Heart: 21 Days to a Happier, More Fulfilling Life, is how I used my heart to buy a house. I listened to the feelings my heart sent me, and eventually we found the right house. As I live life, it’s like I have cat whiskers all over my body. I feel what is right, and what is not. I default to listening to my inner GPS, not to an external source, even if it is family, friends, or world-renowned expert. I know what is needed in my life. If I blindly follow advice from others, I’ll end up unhappy, because no one can know what will work for me. There’s nothing magical about following your heart. To me, it’s a common sense way of living. The reason most people aren’t living like this is because it’s been drummed out of them. We’ve been told that we should make logical decisions, and that everything should make sense. But if you’ve been on this planet for awhile, you know that you can’t really make sense of life. You can’t figure life out. So following your heart means listening to your inner guidance. Or to put it in modern terms: listening to your inner GPS. We all have a guidance system within us waiting to help us. But we have to be willing to listen. Listening to your heart doesn’t mean that all of the challenges and problems in your life disappear. It doesn’t mean that suddenly you’re happy 100% of the time. It means that you start living life more holistically. You live life through your whole being. And it doesn’t mean that you wage war with your mind. It means that your mind becomes a servant to your heart, but you still see your mind for the useful tool that it is. People may say that following your heart is impractical, but what’s even more impractical is thinking that you can control life and force it to bend to your will. Being practical means living your life with your whole being. That means using both your mind AND your heart. For today, experiment with being aware of your heart. Bring your attention to the center of your chest, and notice what goes on. There’s nothing else you need to do. If you’ve never connected to your heart, or if it’s been a long time, you may notice some anxiety or fear there. If you do, feel it fully, and stay with it. That’s the only way to let it go. I don’t want you to take my word for anything here. Go out there and experiment. Discover what works for you, and what doesn’t. Did you like this article? 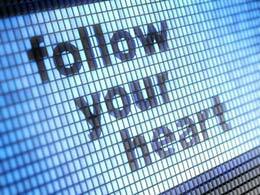 Make sure you read the next installment in the Follow Your Heart series: Why Is It So Hard to Follow Your Heart? why did I jump in to share my feedback now? Good luck with it, and chat soon! Long time no chat. Thanks for dropping by! The first time I noticed my heart was when I started meditating a few months ago. Like you said, there was some fear and anxiety over there. Listening to the heart for me is still something that is quite difficult to do sometimes. I listen, I know what I must do, but yet, fear still grips me and I stay paralysed. There are certain things I feel I have to let go right at this instance and a few things I have to really do to proceed further. That’s what my heart tells me now, and I’ll do them tomorrow. Thanks for the post, it really came at a right time for me. Fear is a natural part of the process, which is why it’s so important to take tiny steps and not try to figure things out. There will always be challenges, so it’s not about getting rid of them, but to learn to relate to them in a different way. It certainly opens you up to being much more peaceful. I find when I don’t follow that instinctive pull I have regret. It’s much better to follow where your heart leads than where you mind does. Hi Henri I am fortunate to stumble over your article on the change site, and then here on your own site, everything makes sense, it sure is the universe connecting me with where I need to be, I have experienced the following my heart, actually this morning, a pain constantly hit me rite in the centre of my chest, and I knew what I had to do to put things right, sure enough I felt much better after apologising – it felt like a weight just lifted off my shoulder’s, I know what my heart really want’s me to do, but financially I feel it will put stress on my relationship and family, not sure what to do now.